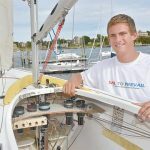 Jim Clark, the founder of Netscape, donated $800,000 to Sail To Prevail, The National Disa bled Sailing Program in Newport, RI. Clark, a keen and focused philanthropist, announced the largest gift in the history of Sail To Prevail after captaining his J-boat Hanuman, to a dominant victory with four unprecedented first-place finishes in four races this past weekend at the St. Barth’s Bucket Regatta. Sail To Prevail, The National Disabled Sailing Program, creates opportunities for children, adults and Veterans with disabilities to overcome adversity in their daily lives through therapeutic sailing. The organization has served more than 15,000 disabled participants in its three decades of operation. For more information, browse this website www.sailtoprevail.org or contact Paul Callahan at paulcallahan@sailtoprevail.org.